The United States Coast Guard Academy is located in New London, Connecticut. Students of the four-year school graduate as officers in the US Coast Guard. In support of its sail training programs, the Academy maintains a sailing fleet of over 150 vessels. The US Coast Guard Museum can be found on the campus in Waesche Hall and contains exhibits the showcase the history of the US Coast Guard. The museum is open to the public. 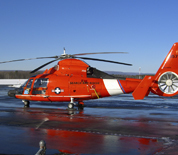 This Coast Guard Academy directory features the critical info you’ll need to navigate through the many facilities and recreational opportunities available on base.